included at MrsMegaByte's new store Aspen Country Gifts. Go to Aspen Country Gifts! 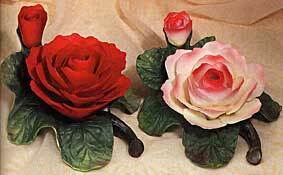 Crafted in porcelain, this rose lights up as a nightlight or for "mood" lighting. Available in your choice of red or two-tone red/white. The large bloom is 5" wide. Note: If your mom, sister, wife, or girlfriend are hard to shop for, this is a great gift idea they're sure to like! 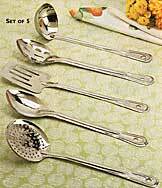 Set contains spatula, slotted spoon, soup ladle, serving spoon and strainer. The shade on this delicately sculpted lamp presents pastoral scenes in bas-relief that glow with a hint of pastel color when the lamp is lighted. Jade porcelain night light casts a calming glow over any corner of your room. With bulb and UL-approved cord. 5 1/2" x 3 3/4" x 9 1/2" high. Hint: A thoughtful baby gift. Six-piece bath set in a charming wooden bucket. Includes two "loofahs," nail brush, hair brush, and 6" mirror. Crafted in delicate porcelain, this music box is red roses. Tune: "Love Story." 3 1/2" x 3 3/4" x 5 1/2" high. PS: If you're one of those guys who won't buy fresh flowers, try this - she'll love it! Quartz clock picture frame holds 5" x 7" photo. Panels are 8" x 10 1/2" high. AA battery not included. Highly decorative pressed glass designs with round etched panels, each featuring a rose - 24% lead content. Gold-plated rose adds a delicate touch of classic beauty - 24% lead content. 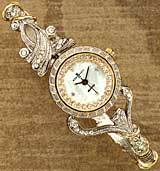 Classic design with simulated diamonds surrounding mother-of-pearl dial. Hint: Appropriate gift for your girlfriend. Pink petals decorate the base of this unique music box. Tune: "We've Only Just Begun." 5 1/4" diameter x 7" high. Hint: Unique wedding cake topper! Bird feeder with fence and foliage. 6" x 6" x 9 1/4" high. Note: MrsMegaByte's Mom wants one of these to hang outside the new townhouse! Stylized horse bookends with a deep bronze finish. 4" x 4 1/2" x 6" high. Note: It's tiny, but your kid's teacher will have desk room for this thoughtful gift for years to come. What are the "Martha Stewart-impaired" looking for? Your comments, ideas, and suggestions are appreciated. If there is something you'd like to see, please let me know. Are you interested in Feng Shui inspired items? Do you like angels, or spiritual and religious things? Would you like gift ideas for hard-to-shop-for persons? If you're a guy, would you like ideas for your wife, girlfriend, mother? If you're a chick, do you need gift ideas for MEN - dad, brother, nephews? Speak your mind! Anything you have to say is appreciated! please use the form below or E-MAIL MrsMegaByte. Who do you most dread shopping for? After you submit your info, you'll automatically be sent back to MrsMegaByte's Home. 4" diameter x 6" high. 8 3/8" diameter x 6 1/2" high.